There are myriad ways to run away from things. Shut down emotionally, move to new cities every six months, speak appeasement rather than truth, silence an incoming call, leave an e-mail unopened, float along in just-comfortable-enough circumstances. Regardless the modus operandi, you find a way away from whatever it is that urges you to turn and run. For a significant portion of my life, for a significant amount of reasons, I was the queen of running away. Switch majors, move to a new town, sink further into a not-quite-right relationship. Risk of exposing whoever-it-is that I was – to myself and others – was quickly quashed in one way or another. And for a time, this pattern worked for me. It kept me comfortable, it prevented a rattling of cages I’d rather not open, and it allowed the conceptions of myself and my world created in the image of my parents and an ill-fitting hometown to remain intact. But that’s the thing about avoiding reality and inconvenient truths: they don’t go away, and at some point you must choose to face them or cling ever-more-tightly to an inauthentic life. And living a life that isn’t your own? It’s a lonely existence. How can you really connect with anything if your can’t connect with yourself? Well, at some point, I realized something was amiss. I couldn’t put it together, but I knew I needed something… an experience, an adventure, a break from my routine. I never truly chose to face myself. I just rode my bicycle 500 miles. I still remember the 2×2 advertisement in Adirondack Sports & Fitness. I’d picked up the free local newspaper from a wire bin at a local eatery in upstate New York during year two of forcing myself through this-might-not-be-right nursing school. I’d seen several other ads for marathons, trail runs, even a 62 mile bike ride. “Those sound like a challenege, but I don’t know… They don’t seem like enough,” I remember feeling. Enough of what? I don’t know. I just know that when I saw an ad on one of the final pages of the paper with a cartoon pig riding a bicycle for an event called “The Great Big FANY Ride”, I felt drawn to read more. F-A-N-Y: Five hundred miles Across New York. Nevermind I hadn’t ridden a bicycle since I was a child, that I no longer owned one, that my fitness routine was primarily composed of napping, nor that the event was just over 2 months away. “I can do this. I need to do this.” I felt empowered by the very idea of attempting something so epic – something so entirely outside of my comfort zone. Without further thought of what it meant, I decided right then I was going to do this ride, and that I would finish. I signed up and paid the entry fee that day. Next step: buy a bike. Fast forward a handful of years, and the bike – Lady Steed – that original bike that carried me through excitement, frustration, pain, sores in all sorts of areas, repair-caused pinch-flat embarrassment, joy, and every other imaginable emotion and sensation that unearths itself during the physical release of endurance events has now ridden roads and mountains throughout the country, including those original life-changing 500 across the beautiful state of New York, racking up mile upon mile upon mile of self-propelled experience. What I learned during that ride and those that followed wasn’t immediately clear, but what you feel with complete clarity is a shift – something significant cracks open. While I’m in the saddle, I feel a kind of freedom I’ve never known before. I can go anywhere, I can see any place. Boundaries of all kinds lose their solidity. If you put in the effort and, more importantly, really believe in yourself, all is possible. That feeling of self reliance, even in the beginning when it was mixed with a healthy dose of doubt, is incredibly liberating. It’s life changing. And so, as the pieces have fallen into better fits and lessons have settled into place, I can now see that riding my bike, riding it for more miles than I knew I could, brought me a sense of self that I couldn’t access through habits and ways of living I’d previously relied upon. I found myself by running away. By running away towards something. And so we arrive at now, where I’ve dedicated a significant portion of my life to bringing other Women along on rides they never thought they could accomplish. To providing a safe and welcoming entry point to the awesomeness of disproving self-doubt. This year was the second annual Women’s 100 – a metric century bike ride started by Rapha, the bicycle accessory company. Women all around the world join together in riding 100km the same day as a Tour de France stage of the same length (a race that still lacks Women riders). Rapha is awesome for bringing this ride into existence, but the ride feels somewhat inaccessible to Women entering the bike world – it’s more for Women already racing and riding hard in the high-end gear Rapha produces. So while a ride has launched from the Rapha headquarters in my city each year (an awesome ride with awesome, fast, relatively experienced Ladies), I’ve led a separate ride for Women who would normally hear “62 miles” and laugh at the sheer implausability of traveling that distance utilizing anything but a car. That implausibility isn’t really about the distance – it’s the disbelief that you can accomplish something like that, especially in your current noodly-legged state. But as I have shown myself, that doubt is baseless, and proving it so is a magical experience. The ride took off this year from the same location as last year, Ristretto on Williams (a wonderful coffee shop and roastery), with myself and a handful of others – experienced and not. 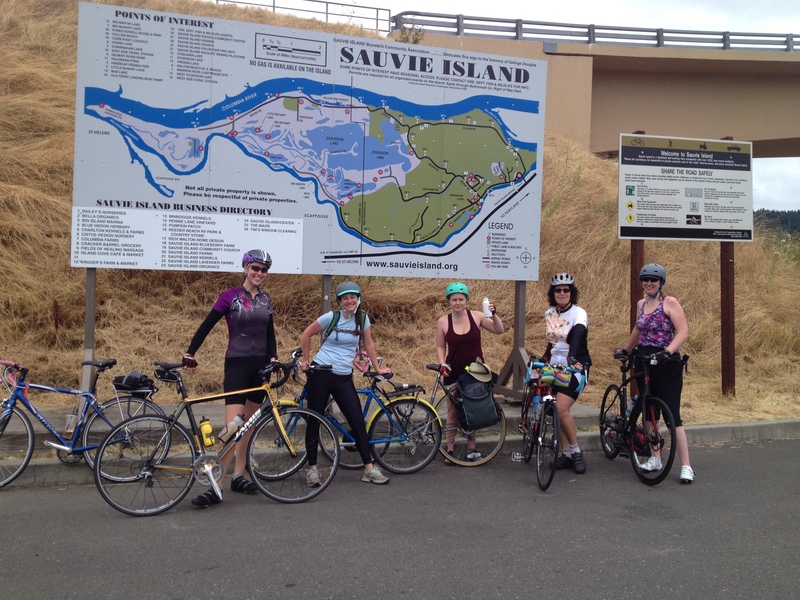 The majority of Ladies rode further than they ever had before, putting foot to pedal for an adventurous tour of swimming spots, farms, beer-on-tap cycle shops (thanks, Cycle PDX! ), street mandalas, almost-there tea, and we-did-it drinks. Sometimes the miles passed without notice, riding abreast immersed in each other’s company. Sometimes the smallest hill felt like hell incarnate. It was the littlest taste of how things like this, pushing yourself like this, can change everything if you let it. It was a taste of freedom and happiness and the rolling hills of life and love and recreating yourself. It was an experience, and one every Lady should have the chance to be a part of. And so we will ride next year. By mountains, by cities, by cows and random scenery. We will ride for the try of it. We will ride for ourselves. And with that, I leave you for the week, Ladies. The featured photo for this post shows the brave and wonderful Women who joined our ride this year. Thanks to everyone who came, and hopefully we’ll see you next year.